The window was open and he went for it. You can’t blame him. Any one of us would have done the same thing, given the circumstances. This story could be a take-off on the ever popular Beatles song, or, about a devious thief in the night, or . . . just a simple reminder not to leave the windows open—it’s just not prudent! (This is a little joke, since Prudence was the one who supposedly came in through the Beatles’ window.) 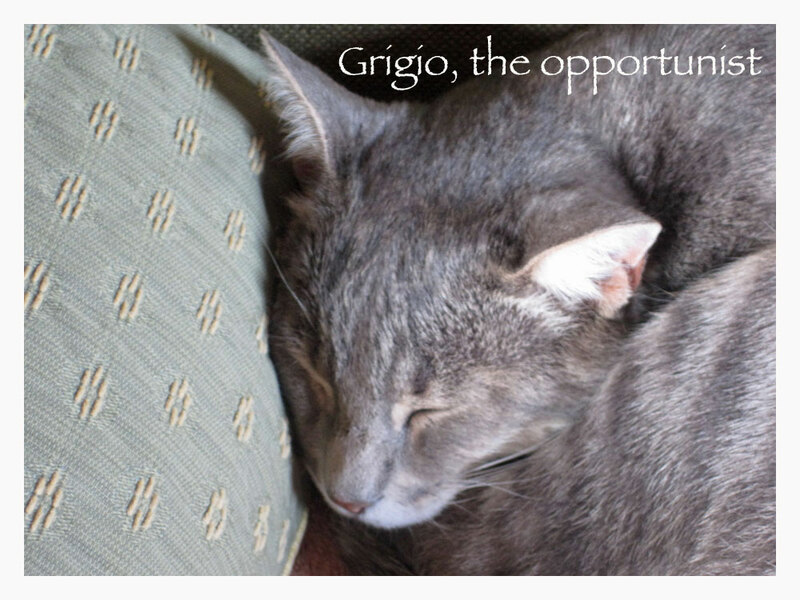 In this particular case, however, it happens to be a short story about a gray cat named Grigio (Italian for gray), who made a few decisions of his own lately. Let’s take a look at what he’s been up to. Separate from the house, there’s a small stone building we use as a studio. 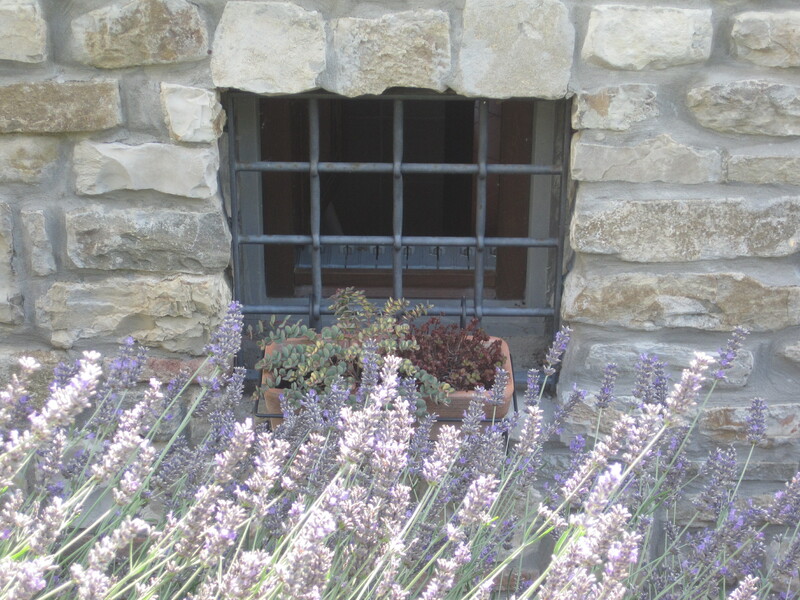 In true Italian style, we have iron grilles over the windows, but no screens—nothing to impede the cool breezes (or the flies, mosquitos, lizards or even the unthinkable—a snake). But let’s don’t get fearful about trying to keep things out. In the Tuscan days of yore, they didn’t even have a scarce thought about such things as screens—there were more important things to tend to. And if they could do without them, then why can’t we? So we do. It just so happens, a stray cat Grigio has been hanging around the place this year. Nobody knows where he came from or, on occasion, where he goes off to. He’ll be here for several weeks and then gone for several more. But, lately he’s done more staying than going. Why? We think he’s starting to like the digs here. About 2 months ago, we discovered a trace of cat hair on the green chair in the studio. Following our hunch, we discovered that the culprit was little Grigio. It seems that he too made a discovery, one delightful night when he realized that we leave the studio window open for air flow. “Hmmm . . . This must be for me!” So in he went to find a cozy spot by the fireplace to take an uninterrupted snooze. Our hunch was further verified when we started finding him there in the mornings. He evidently likes to prowl at night and then come in during the wee hours of the morning. 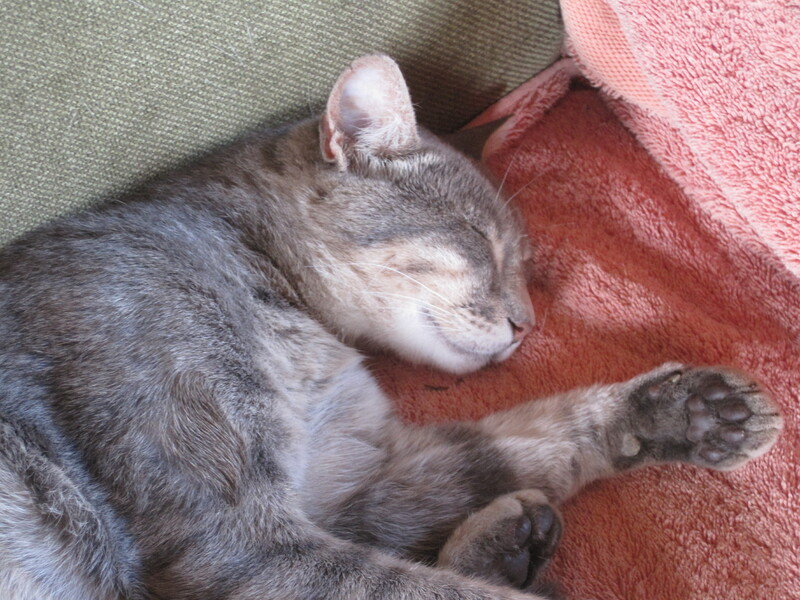 Well, obviously that means he needs to sleep into the afternoon when his new cat day begins. He couldn’t care less that we’re there working. He never even turns an ear—just keeps on sleepin’. Our final piece of real evidence about his not-so-covert plan was when our friend Katie visited, and stayed in the studio for a few nights. It seems that Grigio has a well domesticated side since Katie woke up the next morning with a guest at the foot of the bed. What can you do? Well, don’t encourage him for one thing. We insist on not feeding him since we don’t want him to start imagining this as his “home,” however, we’re sure it has already occurred to our more astute readers, that our condoning of this “window access” is an even louder message blaring with bright lights that says,”WELCOME HOME!” In fact Grigio is probably far more receptive to that message than any scrap of food left outside now and again. Oops! Unfortunately, dear Grigio is in for a bit of a cold surprise when winter comes, because that little bathroom window will definitely be closed. Then what will he do? Who knows? He’s resourceful and will surely figure something out. After all, he found our window, and there must be possibilities like that around every corner in the country for a clever cat. After watching Grigio for several months as he made his life a lot better, we started talking about the nature of opportunity. In our own lives there’ve been many “bathroom windows” that we either went through . . . or not. The problem, as we all know, is that there’s no telling what awaits us on the other side—a nice warm place to spend the night(s), or a pit bull lurking in the dark. But the one thing for sure is that every window closes at one point or another. But for now, this cat knows how to spot real opportunity and take full advantage of it while it lasts. So what’s wrong with that? Sweet dreams Grigio! That’s funny. Maybe it happens all the time. We’ve never had cats, only dogs, so we don’t really understand how they think and behave. 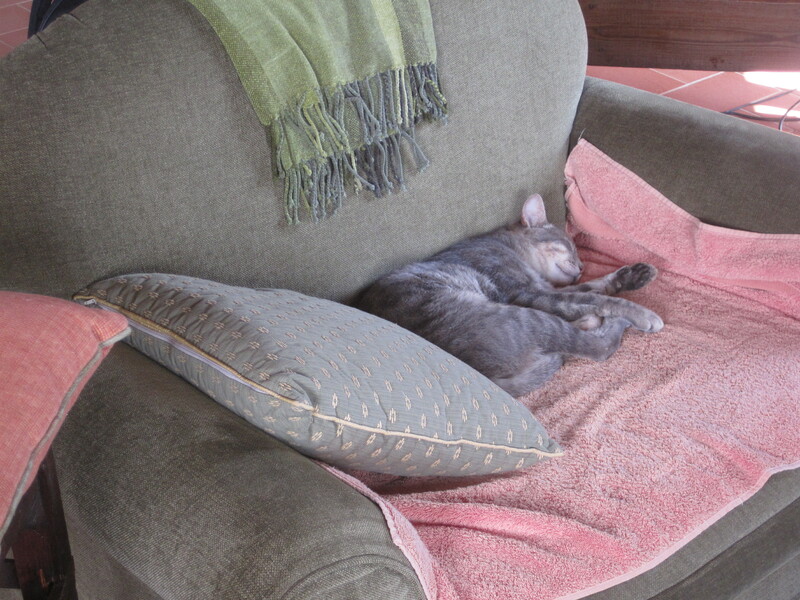 Now we have several cats around (neighbors, and Grigio), and we’re enjoying their company. Also, there’s something irresistable about being in a “puddle of warm sunshine.” Nice phrase.